Photo: A pump will supply well water to this new water tower creating water pressure for plumbing on campus. We are happy to report that the installation of a new plumbing system on our Uganda campus is underway. We are installing a motor pump to route the water from the water well source to the main tank, to the orphan home, to the bathrooms, all throughout the campus, as well as to the medical center, the school, and to the people in our local community. The plumbing system will enable us to have running water with taps on the entire campus as well as connecting the water to the main house so that we can have bathrooms with running water. The new plumbing will bless the children as they will now have access to clean and safe water in our orphan home and at school, to wash their hands after visiting the toilets, thus improving their hand-washing and sanitation. The new concrete water tower will help the water flow easily to all of the needed places around campus. 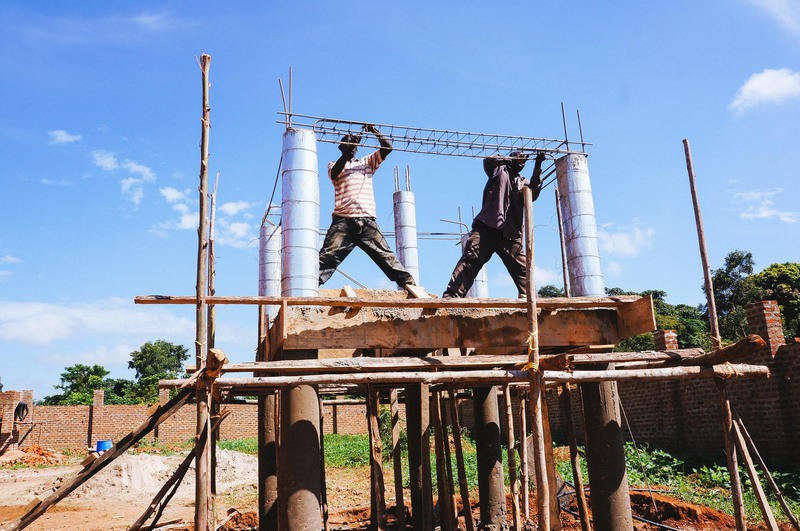 The water tank is being constructed near the main house in order to provide the home with water pressure to activate the plumbing system. With your contributions and donations from our generous donors, we now want to raise $5,000 for a standby generator in the event that we have problems with our solar power, especially when there is no adequate sunshine to boost the solar power system. In the part of Uganda where our main campus is located, there is no public electrical service, thus our solar power is a provision for which we are extremely grateful. 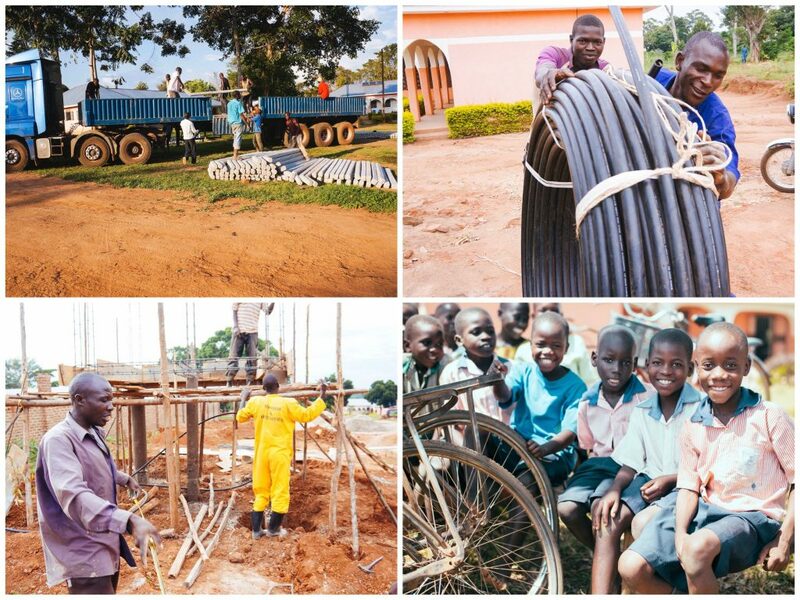 Photo inset: (Top-left): A truck brings in concrete poles from Kampala for our main campus security fence. (Top-right): Plumbing supplies will enable our main campus to have running water. (Bottom-left): Construction workers are hard at work assembling a concrete water tower. (Bottom-right): Students at our main campus school are thrilled with the new developments happening on our main campus. Construction is also underway to build a fence around the entire campus so that we can protect the orphan girls and our other students from those who wish to take advantage of them, and also protect our valuable farmland enterprise. We ordered concrete stand poles, chain link wires, plain wires, barbed wire, cement, sand, and aggregates — these have all been delivered to our campus, and our native team and additional hired workers are making progress on the fence each and every day. Our native-led team continues their hard work on our organic farmland to diversify the types of crops we grow. In addition to our original crop of potatoes, we now also grow beans, corn, kale, and eggplant. This abundance ensures our farm staff’s employment, and helps to put a fresh-cooked nutritious lunch on our students’ plates every school day. In addition, safe drinking water from our well prevents numerous illnesses. We look forward to reporting back about the completed installation of the new plumbing system, and the completion of the security fence. Both projects are a great blessing to our children and our native team, and we give thanks to God. We are thankful for your generous support which makes these improvements possible, blessing the lives of our students.